A good catch action presses the water backwards, which propels you forwards. The catch is critical in swimming because if you fail to get a good hold of the water at the front of the stroke you lose most of your propulsion through the rest of it. Now here's the thing, many swimmers are under the impression that when they have a good catch they'll feel a strong locked-on sensation or a solid connection with the water. By pressing downwards, or dropping the wrist and pressing forwards, they feel pressure on the hand and perceive this as a good catch. Do you feel this when you swim? When you improve your catch technique and start pressing the water backwards, you actually feel less pressure on the palm because you're helping the water on its way past your body. If you are looking for a strong connection with the water then pressing backwards will probably feel wrong at first and you may have backed away from this good technique in the past. This is perhaps the biggest reason why a good catch is so elusive. 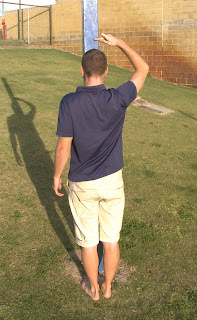 To improve your catch, focus on tipping your wrist downwards, as shown by Mr Smooth above and bend the elbow early on, in front of your head. This will help you press the water backwards. While you develop this technique don't worry about feeling 'latched on' or 'anchored' on the water at first, this will come in time. Many Overgliders appreciate that they need to lift their stroke rate (strokes taken per minute) to swim faster. However, this is extremely hard work with a dropped wrist in the stroke - it's akin to driving a car with the handbrake on. By removing the braking action your stroke rate will naturally lift up without any increase in effort. Our new Swim Type Guides take you through all the drills and visualisations you need to develop this improved catch technique, all specific to your individual needs as a swimmer. Find out more here. One final note: A great catch is technically very hard to achieve and is what separates great swimmers from merely good swimmers. However, to make big improvements in your speed in the water you don't need a perfect catch - just by starting to press the water backwards you'll achieve some nice gains in your speed and efficiency in the water. After identifying your Swim Type we then provide you with a straightforward process to follow to improve your efficiency and speed through the water. The Swim Type system doesn't replace conventional swim coaching, it complements it by providing you with additional insight into how you swim and what's holding you back in the water. Many people are frustrated with their swimming. If you have worked hard on your stroke but are no faster than when you started it's very likely you've worked on the wrong things for your individual gender, height, build, stroke style and personality. The Swim Types system addresses this with a much more individual approach to stroke correction. Also, many swimmers are confused and are thinking about too many things when they swim. The Swim Type approach cuts through that clutter, getting you focused solely on what you need to do for your individual stroke, allowing you to forget everything else. A request from us: If the one-size-fits-all approach hasn't improved your swimming, or has left you on a plateau, then please spread the word that there is a better way. Everyone is capable of swimming quickly and efficiently with an individual approach and style. Recognise your individuality and you too can make rapid progress with your swimming. Climbers call the difference between your arm length and your height your 'Ape Index'. The difference is normally expressed in inches. So if your arm span is three inches wider than your height, then that gives you an ape index of +3. If your arm span is 2 inches smaller than your height, that gives an ape index of -2. We can see there that Paul has an Ape Index of +3. But what's this got to do with swimming? Well if you have short arms for your height (an ape index of zero or less) it's very unlikely you will be able to make a long stroke work for you. Swimmers with short arms will become slower and less efficient by trying to match the strokes per length of long-armed swimmers. If you have shorter arms don't despair, you are capable of swimming at a higher stroke rate than other swimmers without fighting the water. A shorter stroke with a faster turn-over is your route to swimming speed and efficiency. 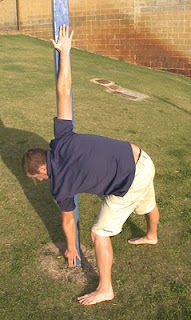 Copying the style of elite swimmers (who nearly all have long arms) really won't help much. You might like the analogy with bike crank length. Cyclists with shorter femurs tend to favour a shorter crank length that allows them to turn their legs over faster. 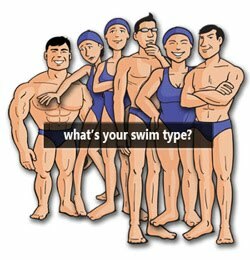 Ape Index is just one of the many physical and psychological attributes that construct your swimming individuality. If you've found that following a particular piece of swimming advice hasn't improved your speed (or even made you slower) then question if this was good advice for your stroke. In swimming always remember: one size doesn't fit all!